Manny is a highly experienced executive with a strong track record in business development, product marketing, sales and channel management. Among the companies he worked for are IBM, DFNN, Intel, VMware. 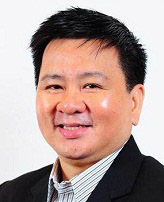 Prior to EDC, Manny was the County manager of VMware Philippines where he established the organization as a strategic cloud computing and mobility platform for large enterprises in the telecommunications, banking, manufacturing and public sector industries. Manny graduated from the University of the Philippines, with a Bachelor of Science degree in Mechanical Engineering in 1985. He enjoys classical music on the way to the office and 80s on the way home.